Deerfield has a great library and I can always get the books I need. I cannot get Louise Penny books in a timely manner, though. I have resorted to eBay. This book I bought for less than $4 and a small charge for shipping. It came from a Goodwill vendor and is even signed! 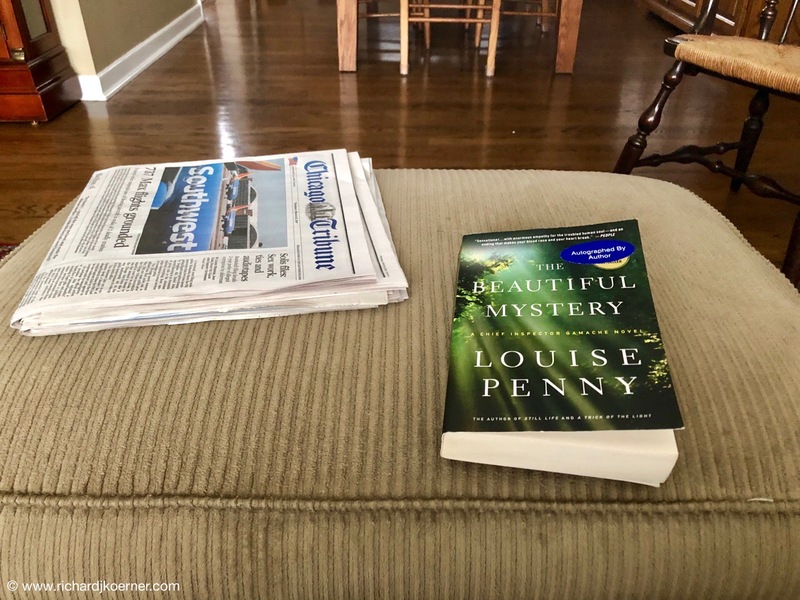 Damn Louise Penny! I have a bunch of books I am dying to read and yet now I have to read the 9th book in the Inspector Gamache Series of Louise Penny. I fear that I have no choice. This is not a bad thing, but a good thing. Everyone, I believe, has someone evil pop up into their lives. In my time, I have had several, here and there. They appear to be champions and winners to others. It often seems that we are the only ones who can see their two-sided appearance and wonder why it is that no one is able to take them down so that they get what they deserve. We see the collaborators and those who fight for justice. We also often see that despite our being on the side of good, that we suffer because of it. We also realize that given the chance to do it again, we would still choose the right side. Louise Penny weaves a tale where good and evil are in the balance, as they always are in life. Take the national situation right now in the United States, for example, where we have evil at the helm and the brink of Fascism on the horizon. Louise Penny plants seeds throughout her novels, little things that seem insignificant at first, as in life, that bloom either well or turn into something poisonous. In this novel, set in a remote abbey in Québec, she pulls out a bit of history and music. Despite the zen that Gregorian chant brings about, in this novel it is the backdrop for the omnipresent struggle of good and evil. In the end, you are left hanging, wondering where it is going. The world as we knew it is totally gone. It had been on a slow move in that direction but the seeds Louise had planted are coming to fruition and some are good and others are, well, horrifying. My counsel? Read this book (The Beautiful Mystery, Chief Inspector Armand Gamache #8) but precede it with all the others. This is an investment in entertainment. This is an investment into seeing terrific character development in a novel. This is seeing that universal situation of good vs. evil come to a new head with computers, media, and drugs, and all within the abbey of the Roman Catholic realm. I am speechless.Damn Louise Penny! I have a bunch of books I am dying to read and yet now I have to read the 9th book in the Inspector Gamache Series of Louise Penny. I fear that I have no choice. This entry was posted in Fiction, Life in general, Literature, Louise Penny, Novels, Thoughts and philosophy. Bookmark the permalink.